I would ask the world what was the cause of world war 1 and 2? I would ask the world why are some country’s poor and some rich? I would like to ask everyone what they are looking forward to in the coming year. Do you know what Fruit Winders are? I would ask the world, if they could wish for one thing ever what would it be? I would ask why do we speak different language’s ? Do we have stuff to hide? What is your biggest achievement in your life? I would would ask the world How do you feel about your country? And what would you do to improve it? I would ask them if they have just came to a different country and what language do you speak? What is your religion and why do you follow it? I would ask the world, how is life like in your country ? I would ask what is your favourite colour and why? It was not Sandy it was me Morgan sorry! Who is your most favourite football person ? 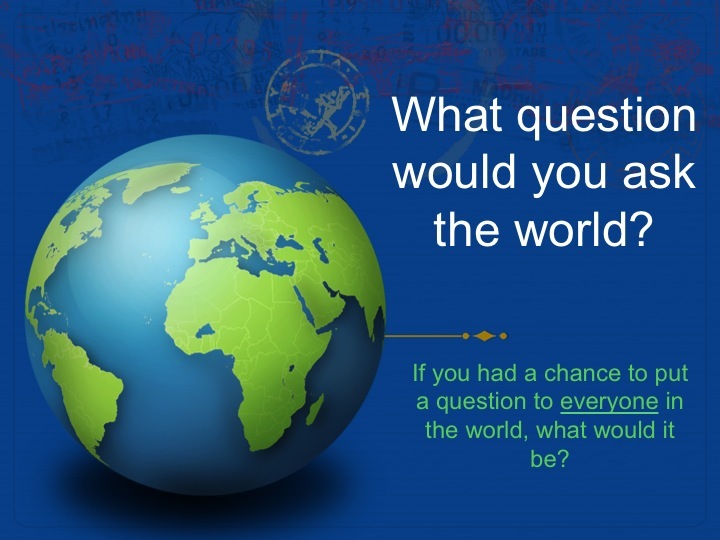 What questions would you ask a different world?